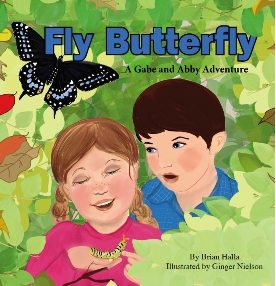 Fly Butterfly by Brian Halla is the true story of the newest adventure of the twins, Gabe and Abby. Their story involves the friendship with a caterpillar and the days that follow. As they search for their friend, "Buster" they witness the changes that take place in the life cycle of a Black Swallowtail. A dangerous situation for the newly emerged butterfly involves a timely rescue and successful release. The book will be released through Amazon.com and other outlets as well as in your independent bookstore. The ISBN 978-0-692-78023-7 or the title will be enough for your bookseller to find the book. Excellent review of Fly Butterfly by Brian Halla. i hope it will be best seller book.